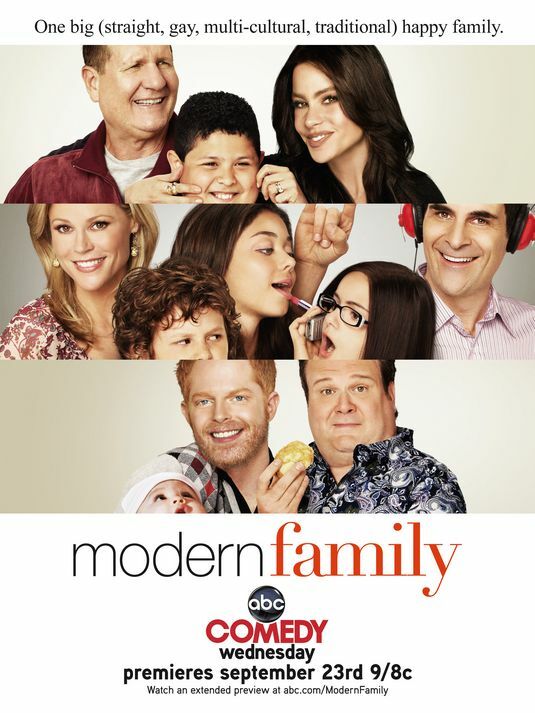 I guess this is a sign of the times: We love “Modern Family” on ABC (apparently, so do the critics). It’s rare a TV show makes both J and I laugh out loud. I guess being new-ish parents has a lot to do with why we get it. This witty and heartwarming mockumentary details the adventures of three very different American families that are interrelated through Jay Pritchett (Ed O’Neill) and his adult children Mitchell Pritchett (Jesse Tyler Ferguson) and Claire Dunphy (Julia Bowen). The appeal of this show is many-fold, but my favorite thing about it is that it takes stereotypes (the wealthy SAHM, the exotic trophy wife, the clueless dad, the drama queen teenager, doting gay dads, etc.) and turns them on their heads. When you peel back the layers, each character and family have their share of flaws, strengths and challenges. What bonds them is that they’re all striving to be the best parents possible despite their differences (and doing so with a big dose of humor). I’m going to have to start watching this … we caught most of the episode on Sunday night, just flipping around after the Super Bowl, and got lots of laughs out of it.